You can find multiple Whois lookup tools on the Internet - like everything else, the best tool is the one that meets your needs or requirements. Sometimes we only need a couple of details so any Whois lookup tool can do the job, but if you are looking for extensive information then you should try using one with a good historical record. Here is a short list of Whois lookup tools that you can use, we recommend having a play with them and use the one which you're most comfortable with. All these tools are free, some of them could offer you a subscription or paid plan in order to get more features or solutions within that website, it’s up to you to review if these features are helpful for what you want. In addition to those websites, you can try finding an extension for your preferred web browser. 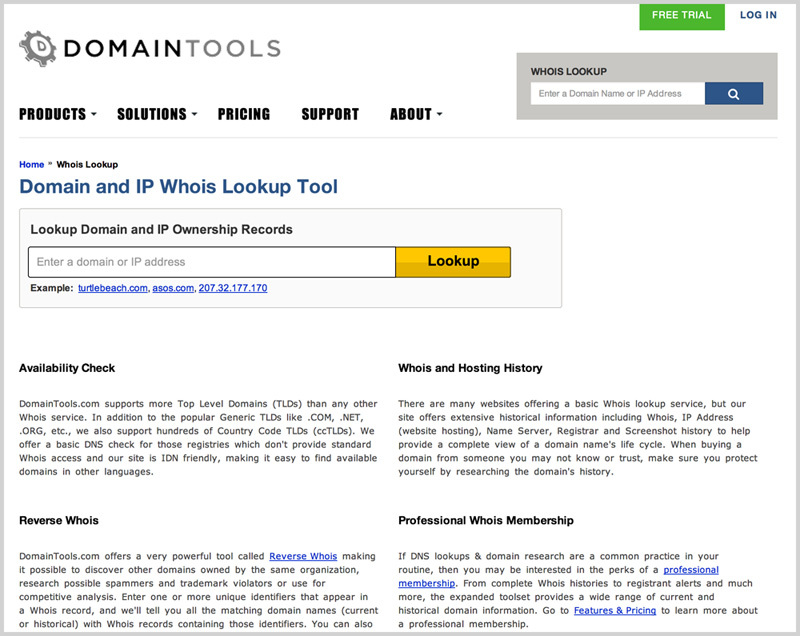 We have our Whois lookup tool of choice when it comes to finding information about a domain name. We have found that the Whois application from DomainTools is pretty effective. Please keep in mind that we are not in any way associated to this company, as I mentioned before, it’s the one we find works best for our needs. We’ll provide some detailed instructions on how to use this tool from this specific website, but all the steps will likely to be similar for your preferred tool too. Image 2.1. Main interface where you can insert the domain name or IP address. You can whether insert it into the small field on the top right or the big field with yellow button in the middle. 4. After hitting the button “Lookup”, you will be redirected to a screen where you’ll see lots of details such as registrar, registrant, email address, name server, etc. Image 4.1. 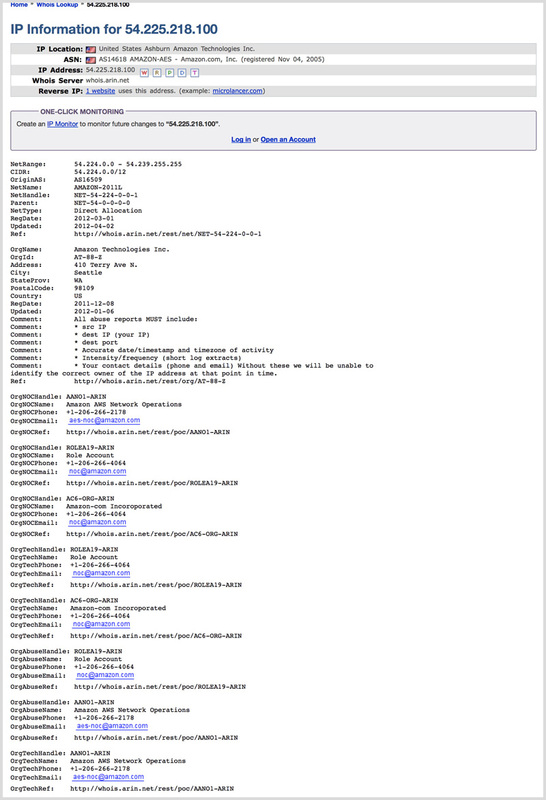 Whois record tab with lots of details about the domain name. If we take a look at the previous screenshot we can see that the Registrant is Envato Pty Ltd and the Registrar is MarkMonitor. Registrar is the company or commercial entity which has registered the domain name but it doesn’t necessarily mean that it is the same company currently hosting the website. So the big question is. If I find my items being illegally distributed on a website. Should I contact the registrar or the web hosting company? You should contact the web hosting company to report a copyright infringement or any case related to illegal use of your copyrighted work or illegal distribution on that specific website. Remember the correct way to report your copyrighted work is by submitting a DMCA takedown notice to the web hosting company which is providing storage or space to that particular website. So the next question is. How do I know which company is currently hosting the website that is illegally distributing my items? Considering the previous screenshot of the “Whois record” tab, if you scroll down to the bottom of that page, you should be able to see something called “Name Server”. Unlike previous examples, these names look a little more complicated, but there is always a solution for this problem. Let’s move on to step 5. Image 5.1. Server Stats tab with additional information about the domain name. 6. In the previous screenshot we already have a clue on which company is hosting the website, it’s Amazon. We can see that by reading the ASN or Autonomous System Number line. But we should double check, we don’t want to send a mistaken DMCA to Amazon. Image 6.1. By clicking on the IP Address you can see more details about the company currently hosting the website. Congratulations! You know now that you must contact Amazon Web Services (http://aws.amazon.com/) if you want to report a copyright infringement or illegal distribution of your work happening on this website. The purpose of this guide is to help you find more information about the specific company which is hosting a website infringing your rights. This tool must be used responsibly, sending a false or wrong report can have legal consequences.